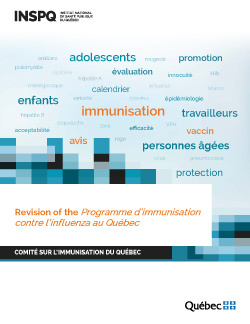 It is recommended to withdraw healthy children aged 6–23 months and healthy adults aged 60–74 years from the list of groups at high risk for influenza-associated hospitalization and death, but to maintain the other groups currently included in the PIIQ. The CIQ recommends that all healthcare workers receive the vaccine. A permanent infrastructure should be implemented to continually appraise influenza disease burden, vaccination effectiveness, vaccine uptake and program impact to be able to quickly make any necessary adjustments to the planning and implementation of the PIIQ.